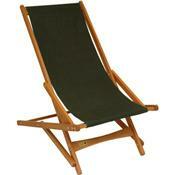 Recline on the beach in your Byer of Maine Penobscot Glider Camp Chair. This Byer of Maine sling chair features a gliding hardwood frame that continuously adjusts as you move, so it's superbly comfortable. An all-weather seat holds up to sun and rain for years of enjoyment. The Penobscot Glider folds flat for easy transport and storage.